TOP: Black Rock looms in the distance north of Wheatfields Chapter House. BOTTOM: Wheatfields Chapter House sits off Navajo Indian Route 9. When you think of Tsaile/Wheatfields/Blackrock Chapter today, you probably think of Diné College. But the college is a relative newcomer to this gorgeous scenery, having moved here from Many Farms in 1973. Before that, this area was known for one thing, and the clue is in the name: Wheatfields. On the fertile plateaus both above and below what is now Wheatfields Reservoir, said Alfred James, 50, people grew acres and acres of wheat and other crops, irrigated by a system installed by the U.S. government in 1885. From Wheatfields, it was a 25-mile journey with a wagon-load of wheat over a rough dirt road to the mill in Round Rock. The farmers could trade some of their flour for provisions there, and bring the rest back to use or to trade at the two trading posts at Tsaile and Wheatfields, James said. After World War II, the economy was switching rapidly to cash, and people began to abandon their fields in favor of paying jobs. The irrigation system fell into disrepair. In recent years, however, a new system has been put in place through a U.S. Department of Agriculture grant, and people are coming back to the land. "We have a very active farm board," said Chapter President Zane James (no relation to Alfred, oddly enough). "The college's land grant department is also very helpful to the farmers." But even before the farms, Alfred James said, the people of the Chuskas were well known. They were some of the fiercest raiders among the Navajo, constantly skirmishing with the Utes to the north over livestock and women. There are those, including Alfred James, who believe that if the people in these parts had not been distracted by the Ute conflicts, they could have fended off the U.S. cavalry and escaped the Long Walk. 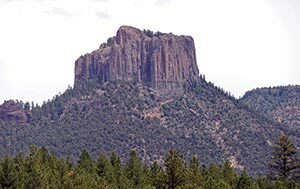 There are stories about Tsaile Peak similar to those surrounding Fortress Rock in Canyon de Chelly, that the people climbed it and successfully hid from the cavalry for quite a while. Alfred said his sons climbed the vertical-walled nearly 9,000-foot volcanic plug twice, once finding "about 24 sweat lodges" and another time finding some very old-looking rifle shells stamped "U.S.," so he believes the stories. For many, many years, the people of the triplet communities of Tsaile, Wheatfields and Blackrock lived a traditional life. There were no paved roads until the 1970s, and everyone just stocked up and counted on getting snowed in in the winter. It was one of those bad winters back in the 1960s that changed Alfred James' life forever. It was Christmas break of his first-grade year. A horse bucked him off and stomped on him, crushing both his arms. The dirt road to Fort Defiance, the nearest hospital, was several feet deep in snow. For seven months, the family waited for the road to become passable. "All I had was the medicine man and Navajo herbs," James recalled. When James finally got to a doctor, all the physician could do was shake his head. The right arm had healed, although James couldn't reach back far enough to scratch his own neck. The left one was a disaster. "At first, they talked about cutting it off," James said. "Then they decided to try putting metal in it." The metal plates held the bones together as they fused, and today James has almost full use of his left arm, although "I have to stay out of lightning storms," he joshed. James never did go back to school, and he was just disabled enough that the Army wouldn't take him. He got a job as a security guard at the new Navajo Community College in Many Farms. And, other than a four-year stint in the oilfields of Texas, he has worked at what is now Diné College ever since. Most historical articles on the college say Tsaile was chosen because of its central location. But according to James, whose grandfather and great-aunt and uncles donated their grazing land for the college, it was more of a last resort. It wasn't just that people were reluctant to give up their grazing rights, James said. It was having a college in their backyards that scared them. "People said, 'If we set up a college, there's going to be a lot of AIM coming in, a lot of hippies,'" James recalled. "'They're going to do something bad.'" According to James, the college's founders originally tried Many Farms, where the BIA had allowed NCC to share space with the high school for three-and-half years until they could make other arrangements. "The people said, 'No! No!'" he said. "They tried from Rough Rock: 'No!' Chilchinbeto: 'No!' Kayenta: 'No!' Chinle: 'No!' Ganado: 'No!' Window Rock: 'No!' Crownpoint, all through the reservation. Nobody wanted a college." Nobody, except the respected medicine man Charlie Benally, James' cheii. "We came back from Crownpoint one time and found him laying on his back, looking up at the sky," James recalled. "He said, 'We can build a college here.'" Robert Roessel and the other visionaries who founded Diné College were thrilled. "They came by our place with a whole truckload of groceries," James recalled. "They promised my grandfather a three-story house, but I haven't seen it yet." When the college was established in 1968, it was the first tribal college chartered by a tribe, "launching a movement that has now grown to 37 institutions in the American Indian Higher Education Consortium and spread around the world," Natasha Kaye Johnson wrote in a 2008 article in the Tribal College Journal celebrating Diné College's 40th anniversary. The college remained in Many Farms while construction commenced in Tsaile. The first students were brought to Tsaile in 1973, and the new campus held its first graduation the following year. To appease the townsfolk who were afraid of "hippies," a strict dress code was enforced, including short hair for the men. There were a few AIM activists among the student body, James recalled, but without their trademark long hair and bandanas, "you couldn't tell who they were." The college brought jobs, educational opportunities and entertainment to Tsaile and it wasn't long before the community embraced it and even became proud of it. Today Diné College is the area's largest employer, with a $20 million budget. It offers 20 associate degrees and, starting this fall, two bachelor's Ñ in business administration and education. A new 61-unit dormitory is going up to house married students and students with children, "to make it as easy as possible for people with families to go to school," said the college's community relations officer, Cuyler Frank. The chapter works in tandem with the college when it can, said Zane James, noting especially the cooperation between the farm board and the land grant office. Name: "Tsaile" is an anglicization of "Tsé’hilii," "Flowing through rock," referring to the rock crevice at the start of Canyon de Chelly. "Wheatfields" and "Blackrock" are self-explanatory. Population: 2,250 at the 2010 Census. Assets: Diné College, Wheatfields Lake, active farm board, new Head Start and senior center buildings, convenience store. Issues: Rugged country makes it hard to extend utilities, harsh winters, bad roads, livestock on roadway, trespassing and vandalism in area around Wheatfields Lake. As might be expected, the chapter that houses the Navajo Nation's first college is a progressive one. Tsaile/Wheatfields/Blackrock has withdrawn eight acres just north of the junction of Navajo Route 12 and Navajo Route 7 for its new compound. You'll see a spanking new Head Start and senior citizens' center there already, deliberately built within a short walk of each other "to bridge the gap between the generations," Zane James explained. An elderly group home, multi-purpose building, ceremonial hogan, day care center and walking path are in the works Ñ and you won't see a single overhead wire to spoil the view of Tsaile Peak since all utilities are underground. After calling a meeting in 2012 of the Arizona Department of Transportation, federal highway authorities, the BIA, Colorado State University specialists, the affected counties and their sheriffs and the Navajo Department of Transportation, a joint safety study was done that resulted in a five-year, $36 million plan to rehabilitate N12 from Whiskey Creek to Wheatfields Lake. "It's one of very few road safety assessments ever done on the Navajo Nation, and we're very proud of it," James said. In addition, the chapter is seeking $6 million in capital improvement funds to improve the campground and day use area at Wheatfields Lake, a popular recreation spot, so people won't be tempted to camp in off-limits areas as they do now. Tsaile/Wheatfields/Blackrock has an active farm board, community land-use planning committee, senior advisory council and veterans' organization. "We're in the process of starting up a youth council," James said, "so we can get input from the youth on what they're thinking and what they would like to see." On the downside, Tsaile a few years back had a string of suicides. But the chapter has reacted positively with its annual Life Preservation Summit, now in its fifth year. "Since traditional Navajos don't like to talk about death," James explained, "we've really geared it toward protecting life, respecting life. It's something we're extremely proud of." The chapter is also partnering with surrounding chapters in the Chuska Regional Council to discuss and prioritize regional needs, James said. Its "dream budget" includes funds to extend utilities to the 40 percent of chapter residents who don't have running water and the 30 percent who lack electricity. That's a tough call in this rugged mountain country. 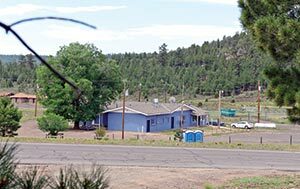 "One of our priorities is to get decent access to Blackrock community," a handful of isolated homes between the two forks of Canyon de Chelly. Once the road is improved, James said, it will be much easier to bring in utilities. "We're doing some good work," said James, who can be forgiven for tooting his own horn a bit as he is running for Navajo Nation Council this year. "It's exciting." There are good things happening, concedes Alfred James, but sometimes he reminisces about the old days, when everyone knew, for example, about the monster that lives in the pointy little mountain you can see from campus. He's seen the students come and go, he says, and young people haven't changed much in 30 years. "They say, 'Mr. James, stop telling those long-ago stories,'" he said. "'You need to live in the present.'"